Try to get full 360 degree welds on each tube by sequencing your weld/install to accommodate it. It's not always possible to achieve, but try to get as much as you can. That is what they taught us in Airframe and Powerplant school back in the '80s. It was my first thought that the tubes should go in one at a time, and there may be a couple of spots that I won't or can't get each one welded 360, but I will try. Got the parts made so I can start welding maybe tomorrow... May have to make one more Jig brace to hold the structure in place during welding. A trick i just remembered, for dealing with the diagonals. Weld all of your vertical members in without the diagonals installed first to get full 360 on them. Now it seems that you won't be able to get the diagonal members into place. In order to make them go in, cut one side of the fish mouth off of one end of the diagonal member using as thin a kerf as possible. Now it will slide right in and you can weld the cut off piece back once the tube is in place. another way we were shown to deal with the problem was to cut the diagonal in the middle and then put a splice over the cut once the parts were in, but that method adds a lot of unnecessary weight and should only be used if the first won't work, for instance if other structural members prevent access to the weld the cut piece. Edit: Dammit, I type too slow, you beat me. Yea... if my welds looked like that I would have a new career.... Oh wait, I don't want a new career, I like being paid to not work.... maybe I should have spent my life on welfare ... not! Of course he's coping. How else would he get those tubes to fit together right? Stainless, something to be aware of is that your 1.5x1 rectangular tubing technically doesn't meet min spec for cage material. At the Jan SCTA board meeting a rule revision (3.B.1 Roll Cage) was passed that says square or rectangular tubing may be used if both leg dimensions are at least 1.62" and .120 wall. Your rect tubing has 96% the CSA of 1.625 OD .125 wall tubing so that does bode well but you'll be in for a fight working against a pretty black and white rule. Just sayin'. I'd make sure that the decision makers know about this ahead of time (now) and not when you show up to run for the first time. Everything else looks great and I'd hate to see you get dinged on a technicality. For someone 'in build' working to the current rule book - how do I find out about pending changes - what do I need to be a member of and how often is that information disseminated to those members? I seem to recall there is something about membership of something on the SCTA site but it is quite buried and I haven't seen it since (I may have recalled that totally wrong) - is that the right approach? Probably should check with the powers that be. I don't build chassis (but I did stay at a Holiday Inn once), but it looks to me that the rectangular bars are "seat and floor supports", not "roll cage". However YMMV. Hope you have a great time down under. John, as I said earlier, if you stick to rule 3.B.1. you will not need to get pre-approval. 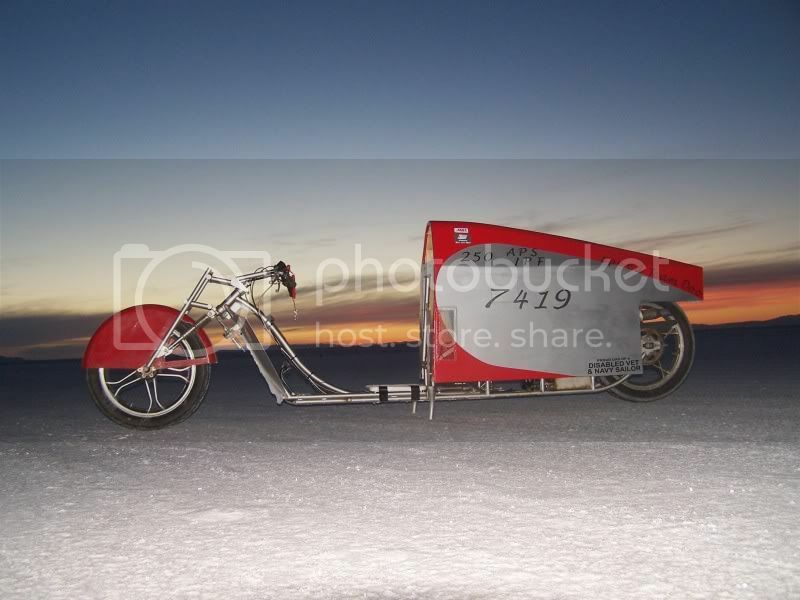 To run El Mirage you need to be an SCTA club member, to run Bonneville you can be a BNI only member. Well, aren't you and Syd part of the secret society?.... A call every now and then to Steve Davies might be a good idea, he'd be somewhere near the wellspring.